It's time to get to know Jennifer Perkins if you don't know her already! 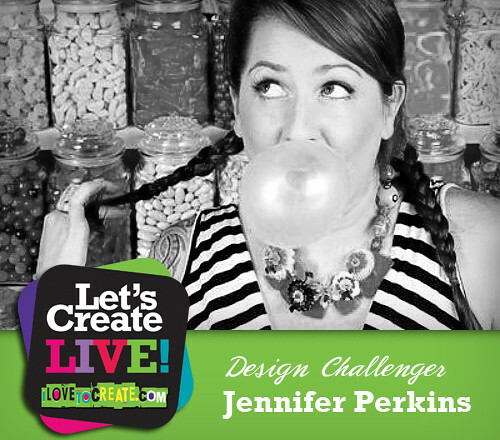 Jennifer is one of our design challengers for our Let's Create LIVE! event and we are so excited that she's bringing her signature kitsch style to our show! Jennifer is the owner an design genius behind Naughty Secretary Club! She is well-known in the Indie craft scene for her bright and unique jewelry creations using vintage charms and findings! Her work has appeared in publications including The New York Times, Seventeen, Bust, Nylon, Teen Vogue, and Life&Style. She's also hosted the DIY Network's Craft Lab and Stylicious TV shows. Jennifer is a founding member of the Austin Craft Mafia, a group of nine independant business owners who are dedicated to fashion, craft, and art. 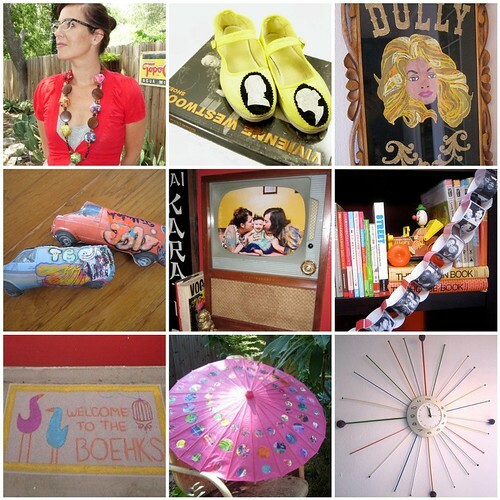 The entreprenual spirit of the Austin Craft Mafia was embraced by other DIYers all over the country and spurred Craft Mafias all over the country! When it comes to business and online marketing, Jennifer is super savvy! She embraced and marketed her wares on the internet via Etsy, long before it became the place to be. Her can-do spirit has energized other artists and designers to do the same! These days, Jennifer is focusing on another major project: being a mom to Tallulah ( 2) and newborn Baxter. We've also been thrilled to have her as an exclusive iLoveToCreate blogger for the past two years (time flies!) Here's just a few of Jen's projects, but you can see many more Jennifer Perkins projects here. We caught up with Jennifer and wanted to get an update on where she's at now! 1. You and your husband recently added another little one to your family...that’s so exciting! How has motherhood changed your creative process/workload? Motherhood has totally changed my creative process. I was always one of those people that when I got inspired I buckled down in my craft room for hours on end and wild horses could not drag me away from glue and pliers. However, with kids you can’t work that. You have to learn to work in small chunks of time. I’m doing this interview right now while my newborn naps and my toddler colors. 2. As one of the many ladies that founded the Austin Craft Mafia and the Indie Craft Movement, how have you seen this movement evolve and where do you think it’s going? The movement is so different that when I got started 10+ years ago. Back then it’s not like we were re-inventing crafts, but it was the beginning of the Indie craft movement. If you wanted to sell the things you made you either sold wholesale to stores (which before hand made was all the rage was hard). You set up camp at craft events which 10 years ago were not the Renegade Craft Fair crowd so it was harder to find a good fit. Your last alternative for selling things was an actual website, there was no Etsy or Big Cartel back then. Marketing was so much different to help drive business before all this social media started popping up. Now it seems in an afternoon you can start an Etsy store, Tweet about, submit your site to a blog to write about it and make your first sale in the same day. The market has definitely become more saturated which is harder on business, but great for the crafts movement. This is not the first or the last time the craft movement has enjoyed a resurgence. I for one am hoping people’s love of Indie crafts only grows. 3. You have a definitive signature style that a lot of artists have copied, sold and pitched as their own. How have you dealt with that? I guess I have just gotten used to it. When Etsy first started I noticed people were using the term “naughty secretary club” as a tag. Sadly these things just happen, no one is reinventing the crafty wheel and if you are going to put your ideas out there it comes with the turf. 4. I know your a big music aficionado! Do you have any music suggestions for someone wanting to get their crafty groove on? Not only has motherhood effected my creative process it has also effected my musical knowledge. I used to be so on top of who was the next hip band and now I feel like I am in the dark. I am thankful for all the good bands on Yo Gabba Gabba or else I might never hear anything besides the theme song to Thomas the Train. 5. You’ve done a bevy of projects for iLoveToCreate.com. Do you proudly display all your creations or do you give them away? After a while, I know your crafty creations have to take up space! It is a mix. I have not thrown any away, but some get displayed around the house like my knitting needle clock and other like my black velvet Dolly Parton hang in my craft studio. They do take up space after awhile, but I get sentimentally attached to my crafts. Especially the ones I make for my children. Here's an Etsy There's No Place Like Home video where you get a peek into Jennifer's world. Her house is so kitschy and cool, just like Jennifer!